Je mange un gâteau délicieux. I'm eating a delicious cake. C'est toujours quand je prends une douche que le téléphone sonne! It's always when I'm having a shower that the phone rings. 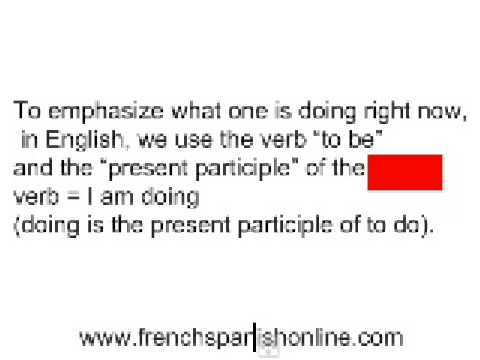 Notice that in French you use Le Présent to describe actions that are ongoing in the present, whereas in English we would use the Present Continuous tense for these actions (as opposed to the Present Tense). Note: There is no equivalent of the Present Continuous tense in French, so you cannot, for example, translate 'I am working' as "Je suis travaillant". Use "je travaille". Marie is working in Paris now.